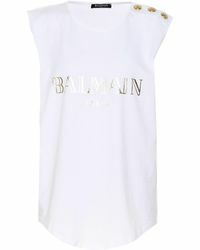 The Balmain brand is one that has been built on a chic an opulent aesthetic that has grown into a rocky and urban look. None of that foundation of sophistication has been lost but the label incorporates bold tailoring, prints, fabrics and cuts that have enabled it to define itself as a serious trend setter. The tops range from Balmain includes everything from sheer leopard-print blouses through to simple red cotton T-shirts. Denim shirts, slogan singlets, foil blouses and floaty chiffon styles are all incorporated and there are pussybows, collars, digital prints, slashed cut outs and cropped tops too.